Wendy has fond memories of her childhood on Sugar Lake in British Columbia. She describes fishing and collecting clams with her brothers and sisters and canning salmon with her mother in their old house. She says she can usually rely on those memories to get her through the tough times. Now, at sixty-four, Wendy says things haven’t been exactly easy since those carefree summer days. In an effort to repress memories of sexual, physical, and emotional abuse in her childhood, Wendy struggled with alcohol and drug addiction for a number of years. After she got married, Wendy moved to Edmonton, where her husband was transferred for work. It was only a few years later that she and her husband divorced, leaving her alone in an unfamiliar city. Despite the hardship, Wendy made things work. Independent and resourceful, she even managed to thrive in her new city, working multiple jobs; at times as a journalist for the paper, at times cleaning carpets or working at the sandwich shop or the bingo hall. She made many friends and got treated by a psychiatrist for the pain she still dealt with. Wendy has always loved riding horses, and she said they helped her heal. The neighbourhood she lived in was unsafe and difficult to access. And, having lost her main source of income, she suddenly faced eviction. 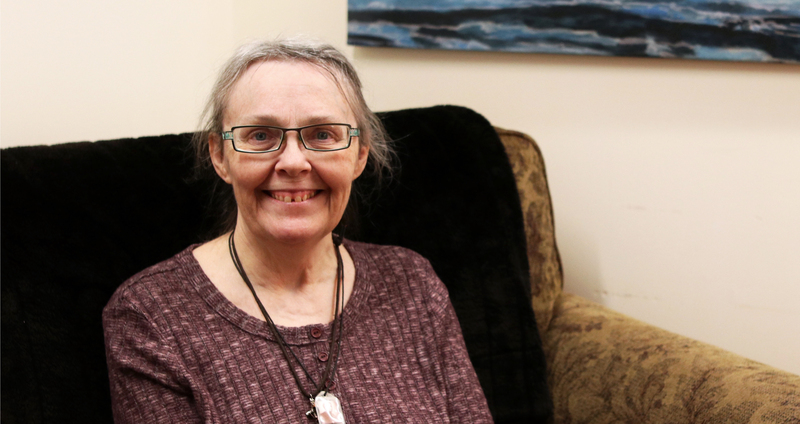 Soon after, Wendy was connected with Kathy from Bissell Centre’s Community Bridge program. Community Bridge offers support to people at risk of becoming homeless by supplementing rent or utilities payments and providing educational workshops. Besides accessing Community Bridge, Wendy also visits Bissell Centre to take advantage of the Women’s Lunch on Tuesdays and Thursdays, and for occasional community meals. She’s taken Bissell’s Ready-to-Rent workshop and has become “great friends” with Kathy, her case worker. Wendy can’t help but feel fortunate when she thinks of all the people in her city who don’t have a place to call home. “I don’t think anybody should live like that,” she said. Wendy still thinks back to those summer days with her family on Sugar Lake. Although it will never quite be the same again, she takes comfort from her past and feels hope for the future. She talks about riding her horses again when her knees improve, and continuing on her journey to health and healing, knowing all the while that she won’t have to do any of it alone. Bissell Centre’s Community Bridge Program is funded by a collaboration of numerous supporters, including ENMAX who helps to cover the costs of utility bills and rent payments to ensure individuals and families struggling with poverty remain housed.